Munch on real Paleo food. Move and sweat. Stick tongue out at PCOS. Here's to a Long Summer! I am now no longer a student. Boo. I refuse to pay adult prices anywhere and managed to get away with child bus fair's until I was about 19 years old, so the coming months are going to be a shock to the system, and the bank balance (not that that hasn't taken a regular beating on the coffee side). Summer is here, and yes I have proof; sunburn. Luckily nothing too horrifying, but colour is definitely there! The forecast for the next week looks positively barmy and since my graduation ceremony is next Monday I think I am going to need to take a spare change of clothes as I know I am going to sweat through the gown! This would make a great side dish at a BBQ to pile on your plate next to some good ol' burgers and sausages. God I love BBQ so much. 'Rice' the cauliflower by putting florets into a blender and pulsing until it resembles rice. Microwave for about a minute on high. Chop the salad veggies into small pieces then add to the 'rice'. Stir in the oil and lime juice, adding more or less depending on how you would like it to taste! BAM. You could add any more extra salad veggies as you want. I used peppers, pickles and tomatoes just because that is what was in the fridge! Carrots would work really well because of the crunch. Now if you shall excuse me, I am off to have my nails done for graduation on Monday! Trying to get in the habit of celebrating that doesn't involve food! Do you have any summer Paleo recipes? What is your favourite way of celebrating success? I feel as if my body is fighting me. Like literally wrestling me, pinning me to the ground, and the umpire always gets to 10. There seems to be none of this two steps forward, one step back BS. I feel like I am taking zero steps forward, and then every so often my body sucker punches me back ten steps. Ok, that might be an over-exaggeration but I am sure the frustration level would still be the same if it was that drastic. There. I said it. Sometimes you can't be up-beat and positive, and today is one of those days when my cup is empty. I have been battling with my knees for a couple of years now and that makes exercise a pain in the bum. There are days when it hurts to walk, and then there are days that they feel fine. I can jump around in a combat class one evening, and wake up fine; other days I can have done a bit of walking around campus and be woken up by the pain. WTF man?! I have had X-ray's and MRI's done in the past week and nothing came up on them which, on one hand is great as it means there is no structural damage, but on the other, it is so unbelievably frustrating. I like to have a problem to solve but this isn't one of them. I did physical therapy for 4 months while I was in America last year, and that barely did anything. Now, I am heading back to the physio again. I am hoping and crossing both my fingers and toes that maybe this time something will come of it. While I was at the gym today, I could feel the tears starting. Yep, I have been that idiot who cries while working-out before, and today I almost did it again. For the past couple of days my shoulder has been giving me some discomfort and it has been preventing me doing my already-adapted-to-suit-my-old-lady-knees-though-I-am-only-21-routine. The eyes were welling up and all those other problems that are in your life right now join in on the fun; my body is determined to make me cry. I think I need to spend some time listening. I have proved to be very good at overriding my body and that is why we are in this constant push and pull relationship. I have taken my body doing this as it telling me "This is as good as you are going to get. Ha." when actually it could be saying "You will be better. But this won't happen tomorrow." On my recent trip to Berlin to visit some friends, I stopped by the 100% Paleo restaurant 'Sauvauge'. I realise that that makes it sound like I happened across it and casually wandered in on a whim to refuel. This wasn't the case. I researched, I planned, I made reservations, I decided what I wanted to eat from the online menu way in advance, I jiggled up and down on the subway ride, and I almost flat out sprinted to the restaurant. Oh, my two non-Paleo friends were dragged along behind where one even commented at the speed of my pace. I was very excited because I had never had a meal cooked for me that I knew I could be completely comfortable with! No substitutions had to be made for anything to make it clean, and I could choose WHATEVER I wanted on the menu, say whhhaaatttt? That is unheard of. Needless to say, my expectations were probably too high. Not that they were completely shot down by the experience; I came out feeling full but clean, satisfied but not blown away, happy and relaxed but questioning. I had a contented smile on my face but also felt that anti-climatic feeling. For a Wednesday night, the restaurant was almost full. There were people at every table and I would hazard a guess that the majority of them were regulars. Some had a slightly hippy look about them that many associate with the more orthodox principles of Paleo, while others chatted with the staff like old friends and didn't get the schpeal about what the hell Paleo is when they sat down! The atmosphere was welcoming and intimate. A big blackboard was mounted to the wall as you walked in that listed the basic principles of a Paleo diet. The walls were clay based and the only light came from candles, creating a warm glow inside our 'cave'. I can't make up my mind whether this is too cliche or not, but I went with it and I think it added to the experience even if it was fueling a stereotype. I was worried about what my Paleo virgin friends were going to think, and what they were going to eat, but they went in with open minds and dived in like I did! The olive tapenade was gorgeous, as was the onion and sesame spread. The orange chutney was a little overpowering after a while. Pickled vegetables and a smoked fish were also on the side. The bread was spongy and light, I have no idea how they managed to do that as whenever I have tried it has come out like a brick and crumbled to pieces. This had the texture of proper bread and was very satisfying. The mutton was lovely and tender, and the sauce was just the right level of ginger and cinnamon with big pieces of roasted plums swirled into it. My friend loved the halibut and the mashed root vegetables on the side. Both of these mains came with a side salad in a citrus dressing which was a fresh and crunchy accompaniment, though a little unnecessary. No room for dessert as the portion sizes were pretty big! I couldn't even finish my tajine and felt extremely guilty as it was very expensive. That is probably my biggest complaint about Sauvauge and where the anti-climatic feeling came from as I am a broke student! My starter and main came to nearly 40 euros, so just over $50! Yes, the portions sizes were great, but there is no way I could come here more than twice a year! The food was lovely, but at the same time I felt like I could make a pretty decent tajine at home (though definitely not as good as this!) on the cheap, and while the cracker and bread combo was a great change to what I normally eat, it just made me crave 'real' bread. I have learned over time that substitutes and paleo-ized foods are a slippery slope, for me at least. Overall, I enjoyed my visit. The staff were very helpful and obviously very passionate about the lifestyle and their business. It is amazing that the Paleo word is being spread into the culinary streets of Europe and America, and not reserved to online blogging and books. I was very excited to see that the restaurant was full for a mid-week night which gives me high hopes for the future of 100% Paleo restaurants! Sauvauge is a more upper scale restaurant and I appreciate that. However, I now want to head on over to San Diego and track down the 'Not So Fast!' primal food truck to try some Paleo street food for a fraction of the cost that I paid in Berlin! Sauvauge is right; the Paleo Revolution is coming! And I know I am on the right side. It's the side with the meat and the good times. Recipes Top Of My To-Do List! I am aware that I have neglected you all for a few weeks now! I blame end of term, dissertation stress, revision stress, and the fact that I have eaten A LOT of Lindor chocolate. Oops. I'm looking forward to Easter being over and there are no more of those eggs in the supermarkets. My god they are so damn tasty. How is everyone's Easter plans going? Chocolate is sooo NOT Paleo, though I have been on the look out for some good quality dark chocolate eggs. My family don't buy Easter eggs, not since I was under 10 anyway, but I am interested to see if there is anything out there. I have found this little beauty which will set you back quite a lot both money wise and inches wise. Off to Berlin next week after a disastorous attempt last week...snow at the end of March in this country ground all planes at my local airport. Luckily I am staying with friends so the only thing I needed to sort out was the flights! There is a Paleo restaurant called 'Sauvage' in Berlin which I am hoping to try as a special treat. Never been to a full-blown Paleo restaurant before so I am a little excited. I have bursts of inspiration; I can feel fit and healthy and on the right track one day and then the next day, I can feel 30lbs heavier and completely out of control! I have been getting this a lot recently. I need structure to function! We are coming up to the end of term and I definitely need a change of scenery. Once you get out of a certain routine, a way of eating, or just let something slip, I find that it all can go to pieces, and a big change is needed to get back on track. My diet for the past couple of weeks has been very hit and miss. I have had perfect Paleo days, and then I have found myself gorging on Maoam's and chugging Diet Coke. Why do I do this? It isn't even that I like the taste of these things all that much. In fact, I have now found that fizzy drinks completely mess up my insides. This may get a bit personal but after drinking a can of diet coke, I have to run to the toilet. Anything with aspartame or stevia or any other brand of artificial sweetener is not welcomed in my body! Convenience- the crappiest excuse. I hate hate hate doing something because it is the most convenient. It becomes even worse when I hear myself justifying the chocolate because I am conveniently feeling stress. This is NOT good. Boredom- I love Paleo food. Love it. But there are times when I can't even look at a spinach leaf without wanting to barf. For some reason, I just get massive aversion to a certain food group! This leads me to feel annoyed with my situation, or angry that a friend can gorge on pizza and I can't. It is funny though that when I do feel this, I never act upon it when it comes to my meals. I haven't eaten any bread, pasta, or any other grain/legume/bean food concoction. No, when this happens, I snack and snack and snack on 'Paleo-ish' foods. For example, today my lunch consisted of 50g of Vegetable Crisps, a handful of blueberries, and no less than 10(!) chocolate dipped dates!! Why did I need 10? 2 would have been plenty. None of these foods, except the fruit, are really paleo. They are the more paleo options than say regular crisps, or an actual chocolate bar, yes, but it is definitely cheating. Last night I made a Paleo dinner for me and my best friend. She has had to listen to me rattle on about Paleo this, Whole30 that for a couple of years now. I have tried to convert her; numerous articles infiltrate our facebook messages, Whole30 books end up on her desk. She appreciates where I am coming from, but she says she loves grains too much! Doing this dinner wasn't an attempt to have her cross over to the meat-and-veg lovers side; she loves all food, it was more a way for me to share what I eat with friends. I made Juli's, from PaleOMG, pork tacos, and Michelle's, from Nom Nom Paleo, Chocolate pots de creme. YUMMY. They went down a treat! Definitely will be making those again! Finding new recipes does get you a bit more focused and renews your faith in the lifestyle. Hopefully when I go home for 5 weeks on Saturday, I will be more focused and more positive. Lifting heavy weights also helps...I'll try and write a bit about my workout ways soon. This week has been a mix of successes and failures. Failure- Ate far too much chocolate with a friend while hiding from all the loved up couples on Valentine's Day and watching various Nathan Fillion films. I love him. Success- Got a really good plan set up for my dissertation. I now know what I am doing! Failure- I dropped my toothbrush in the toilet this morning. Fished it out, washed it, about to put it in my mouth when I had a change of heart! I need a new toothbrush. Success- Made a Ratatouille from my new Paleo Slow Cooker recipe book. Delicioso. Failure- Got lost on campus, at midnight, trying to get to the bus stop. I have been at this University since 2009. Success- Managed to up my weights quite significantly in the gym. In particular my triceps and chest press. Woohooo! I'm finding it hard to stay on track with the eating side of things. I keep reaching for 10p sweets or Lindor chocolate eggs. Eugh Easter candy. I have decided to come up with a list of foods that are 'Worth It' and 'Not Worth It' to help me stay on plan and not feel guilty. For example, artificial crap like haribo sweets are definitely NOT worth it. I don't even really like them! They are just an instant sweetness to pop in your mouth aimlessly. A square or two of dark chocolate with some sea salt is worth it. I'll keep working on it and give you a peek at my list once i'm done. 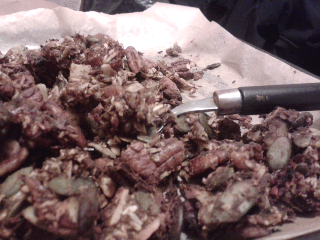 Tried another new recipe today...Pumpkin Paleo Granola which I found on the fabulous PaleOMG website that I religiously follow. Juli is hilarious and so down to earth! Go check out her blog. You won't regret it. I wanted something a bit different for breakfast that wasn't focused on spinach and eggs in various ways. I am a bit dubious as to whether it will keep me satisfied as there is no protein in it but I shall give it a go. I can always have a side of boiled eggs or something! Crunchy, pumpkiny, thanksgivingy, lovely. Great with coconut milk too! So, I am trying to pull my socks up and get back on track! I'm just going to do a Whole7 and then go through the reintroduction phase how I should have done in the first place! Instead of just introducing some dairy for the first few days I jumped in head first with chocolate, frapuccinos and alcohol, so of course I felt like crap. I hadn't missed feeling bloated or groggy that's for sure. Culinary creations this week include the 'Italian Eggplant Strata' from this book that I don't believe I have mentioned before...'Well Fed';) It was delicious. Surprise, surprise. 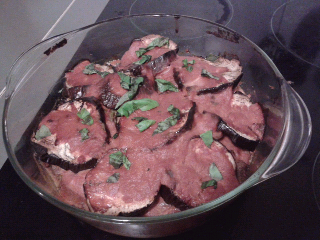 Layers of eggplant (aubergine to us Brits), sausage meat, and tomato sauce. Think lasagne, but better. I made a huge batch and it lasted a few days! Moving wise, took a bit of a break for the past week. I did 3 workouts so not too bad but nothing overly sweaty! Went to Body Pump this morning an upped my weights a little. Ouch. My triceps hurt. Pilates was good again; I can see myself getting in on that. My aim for the year is to be able to touch my toes and I think Pilates will help with that! Flexibility is so important. Perhaps even more important than strength sometimes. Especially on the preventing injury front. I know that my tight hamstrings are not doing my knees any favours. Happy February everyone! January is officially behind us. Thank God. Now onto Pancake day! Have you tried out any new workouts this week? Subscribe To Munching and Moving!